Breakfast at the Orchard House Bed and Breakfast is always an experience. We make it fun, delicious, engaging, and filling. Our guests have consistently commented on loving the locally sourced ingredients, the multi-courses, the impressive homemade recipes, and often that they didn’t need to eat until an early dinner! We want the first meal on your vacation to be memorable and delightful. It all starts with the coffee….we proudly serve local @tragerbrothers coffee….the roastery is located in downtown Lovingston and often when the wind is just right, we can enjoy the smell of roasting coffee beans. We also offer a wide range of teas for those who prefer, and juice with breakfast. When your original reservation is made, we ask if there are any dietary restrictions or allergies, and we confirm this detail during check-in. We offer gluten-free, vegetarian, vegan, and “I just don’t like bananas” options! Our first course is always a seasonal fruit dish and a homemade pastry. Our cinnamon biscuit has become our signature baked good, and one of the most requested recipes for our guests to take home. We shop local farmer’s markets and pride ourselves in serving the freshest seasonal fruits and vegetables. Our main dish varies every day, as well. We are honored to have return guests…some have visited 5-6+ times since we bought the b and b in 2016….we want to keep them coming back with new, inventive, and delicious recipes. Our most popular breakfast dish is Eggs Benedict….I have to brag that Mike’s homemade hollandaise sauce gets consistently described as “the best I’ve ever had” by our happy guests. 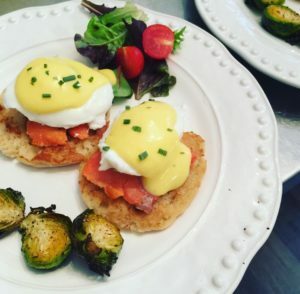 This last weekend he mixed things up by preparing his Eggs Benny with smoked salmon instead of canadian bacon. WOW! Of course, it was a huge hit. Some of the other dishes include: veggie omelets served with a side of fresh salsa, bacon, and toast, waffles garnished with sauteed local apples from @drumhellersorchard and unforgettable local sausage from @doublehfarms, country skillet dish with hand-shredded potatoes, veggies, bacon pieces, and cheese, fried rice dish with fried eggs, bacon and toast, french toast garnished with strawberries and bananas and homemade whipped cream….are you drooling yet?? Although we take great pride in our presentation, the most important part of breakfast to us is that (1) it tastes amazing and (2) we serve generous portions. This is not a gourmet/foo-foo type place where the plated item is the size of a silver dollar and drizzeled in sauce! In addition to the wonderful food, we try to create a memorable experience while our guests are enjoying breakfast. We have background music, fresh flowers and candles at each table, big windows with natural light and gorgeous views, and delicious food served plated, hot, and fresh. We set up individual tables for two, as well as a large center table for any groups traveling together. We love setting up the tables with linens, chargers, vintage silverware, and crystal glasses. At the end of the breakfast time, we always make sure our guests have the perfect day ahead of them. We take time to help every single person chart the best possible experience, and love following up later to hear how it all went. Here at the Orchard House Bed and Breakfast, we want your vacation day to start out like a king and continue like royalty. Come see and experience firsthand how much fun breakfast can be!